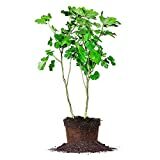 2 Brown Turkey/ Mission Fig Plants in 4 Inch Containers, Well Rooted and Sturdy! 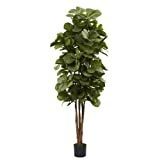 Fig tree for sale – a wide area is needed if you plan to plant a fig tree on the ground. Knowledge on proper root containment is needed if you consider buying a fig tree for sale as its roots will make vigorous growth at the expense of a good crop. Soil – Fig tree grows well in a well-drained, fertile soil. The best type would be a loamy soil with lots of organic matter in it. The perfect pH for growing a fig tree is 6.0 to 6.5. Give your fig tree a wide area to grow in if you are planting on the ground. You can plant your growing fig trees about 15 to 20 feet apart. Mature fig trees have strong roots that can damage sewer pipe and other underground systems, so make sure to stay clear and plant away from these. Weather – a sunny warm climate is best suited to grow a healthy fig tree. It requires full sun. Because they are meant to thrive in a Mediterranean climate, it is important to protect young fig trees against the harsh winter months. You may do so by covering the base of the tree with leaves or hay and wrapping the branches with blanket. 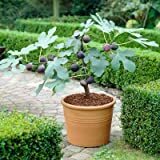 If you are growing it in a container, you may bring your fig tree inside your home before the first frost and move it back outside when the ground is warm again. Nourishment – the fruits of the fig tree usually becomes tastier if they are not over watered. 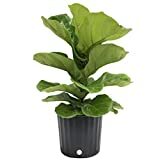 During the first year, as plants become established, water regularly and mulch. 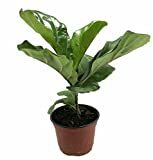 Once it is established, water only every couple of weeks because this plant usually does well in dry weather. Since it is an easy plant to maintain, you should fertilize your fig trees annually. If you have heavy soil, fertilize the tree when the buds swell. If you have loamy soil, you can fertilize with half the amount required. Be careful though not to have too much nitrogen in the soil. Pruning – fig trees do not require much pruning. If you wish to do so, prune in late winter just before the growth so you do not injure the plant. Remove the weak branches and prune to keep the tree small if desired. Harvesting – the usual yielding season for fig tree is in summer or autumn 2 years after planting. You will know that the fruit is ready for harvesting when the skin is soft; occasionally a tear of sugary liquid is secreted from the ‘eye’ at the base of the fig. They also split when gently squeezed. You can eat your harvest fresh from the tree or it can also be dried up.